Meet the 360Q crew: Meet 'Couplamums' Part 2! Meet the 360Q crew: ‘Couplamums’ Part 2! 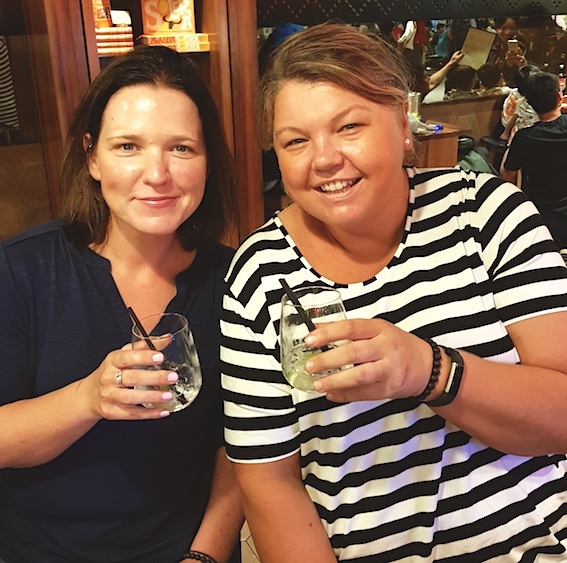 Family antics, bowel blockages and vasectomies, nothing is off limits in the kitchen banter of our sweet treat queens Brooke Glover and Kylie Iddles aka ‘couplamums’. They love hanging out together and creating some amazing meals and sweet treats for our guests and styling the hell out of an entree or two. As part of our ‘meet the 360Q crew’ series, read part 2 of their hilarious Q&A! You seem to always have fun in the kitchen – why do you like working together? Brooke: We can just read each other’s minds. We work well and are a great team. We care about food and flavour in equal measure. We’ve been through plenty of highs and lows together and we balance each other out. Kylie: We have so much fun together. When I’m not working with Brooke it’s like I mourn or pine. I have been known to send her a pic of her empty spot on the bench with just an apple (because that’s all she eats!!) saying ‘wish you were here’. Whilst we don’t stop working, we don’t stop talking either. We have a lot to verbally purge and we purge. We counsel and we doctor (Google) to give each other advice on any bowel issues anyone’s having in the fam (Brooke has three boys so there are issues!). Funniest moment you’ve had together? Brooke: There are funny moments every day without a doubt. There’s been so many. Unfortunately, many of them aren’t to be repeated in polite company. It’s not the end of a shift until we’ve had at least one cross legged, doubled over crying episode of laughter. Kylie: I love working with Chook, she completes me! Together we can work like oversized ballerinas doing Swan Lake. We only have to look at each other in the eyes to telepathically communicate … it’s ingenious! Our productivity is high and we pride ourselves on it. You ladies cover some pretty open and honest discussions in the kitchen – there any topic that is taboo? Brooke: We talk about EVERYTHING. There’s not much we haven’t chatted about. I’m sure the other staff wish they could un-hear some of our conversations. We don’t get embarrassed by much nowadays. I would say belly buttons and the word ‘moist’ are out of bounds? Kylie: No taboo topic is ever too taboo or off limits. We laugh ‘til we can’t breathe and until our bellies hurt. Only once have I laughed until… Oops, this is being published, yes? Favourite kind of dish to prepare for 360Q? Brooke: We just love food and new flavours. I am partial to a big batch of cookies or a special occasion cake. I’m extremely lucky to have the benefit of learning from Barry and his 43 years experience in the industry. That man knows Asian flavour inside out and I have learned so much. You do work offsite as well catering for other functions – memorable ones? Brooke: We have seen some grand homes and stunning properties. Truly spectacular. Sometimes guests arrive via private yacht or helicopter. Some of the most memorable, loveliest functions have been very simple family affairs. You leave with a smile on your face when guests kick off their shoes, loosen their ties and dance the night away to ABBA songs in the kitchen! Kylie: We coordinate all of the preparations of any in-house and outside catering, which sometimes calls for an obligatory after-work gin and clipboard meeting, just to dot the i’s and cross the t’s. Some of the jobs we call ‘blue’ or ‘big boy’ jobs or really they’re just too big! So the downstairs kitchen staff willingly oblige (would you mess with a couple of mums with knives in their hands?) Brooke and I have had the privilege of being present at some amazing outside functions and at 360Q, and stood in some beautiful homes. We’ve been welcomed almost every time I do remember feeling a little like ‘the help’ or a ‘pleb’ just once! That’s a tell-all book for Penguin though. We have the pleasure of making so many people’s special day as wonderful as it could be, and that gives us a special mum moment. My favourite functions have been at Bolobek in Mt Macedon, the most amazing property and grounds for the most amazing family. The Robertsons have thus far been my favourite because I get a kiss, a hug, a thank you and our names are remembered. That is awesome and goes a long way. What do you like to make at home? Brooke: I’m a pretty plain cook actually. A bit of retro ‘mum food’ is popular. I do like to bake at home and love summer. Cooking is how I hug people. Kylie: Home cooking at my house is very basic – I can’t disclose without sounding like Margaret Fulton’s love child. What are the challenging aspects of the job? Brooke: The challenge is maybe in the long hours and hot conditions. We don’t enjoy sweating. Kylie: Family sacrifice. For the first seven years working with the company I didn’t see my kids on weekends and or during Easter and Christmas holidays. However, you have to work. But the kids, Zac 19 and Paris 14, turned out OK! Another challenging aspect at 360 are staff – not a lot of people want to work in hospitality anymore. Why? It’s hard work, you get dirty, your makeup runs, your feet hurt and you get varicose veins the size of roads. So when we find a good one we nab them! The heat is also a challenge, as Brooke will attest. I don’t do well with the heat. So we always have a 20kg bag of cornflour at the ready. Worst catering disaster – spill the secrets! Brooke: I have arrived at weddings to find the cake that Aunty Betty made has collapsed in transit. There’s a bit of creative repair work required. It’s about developing a boy scout persona in those scenarios. We are pretty organised and a little OCD so we usually can cope with most situations. There’s been the odd power outage mid-service, ‘rustic’ settings, guests who become ill or been “tired and emotional”. I’m pretty sure Barry might confess to having crashed the catering van a few times! Check out our menu for more amazing options! 360Q is open seven days a week for breakfast and lunch and for dinner from Thursday to Sunday, and from December 26 we will be open for dinner seven days a week. Call 5257 4200 or email enquiries@360q.com.au to book.